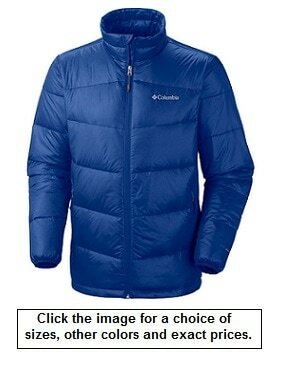 Most men who prefer using high quality sportswear during their various winter outdoors activities will first consider either Columbia or North Face, two very popular brands that make a wide range of high quality apparel for various outdoors activities. As both companies offer a wide selection of quality men's jackets, coats and parkas, it can be quite difficult to choose between the two brands and the various types of apparel they make, specially when some are quite similar in look and features. 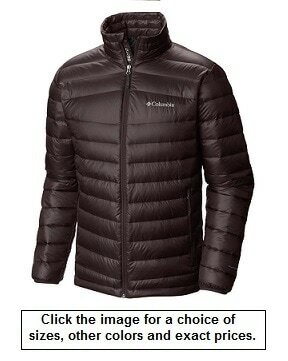 ​To help select the most appropriate brand that fits your taste and needs, this article will try to point out some of the differentiating points between the two brands and present you with our selection of the most popular Columbia and North Face men's jackets and parkas bought by Amazon customers. Columbia was founded in 1938, as a hat distributor out of Portland, Oregon and grew to become a multi-million-dollar outerwear giant. On the other hand, North Face was first established in 1968 in San Francisco as an equipment retail store for outdoors fans and evolved to become today one of the largest and most popular names in outwear. Note that both companies make their products with 100% responsibly sourced down. They are both committed to ensuring the highest industry animal welfare guidelines. 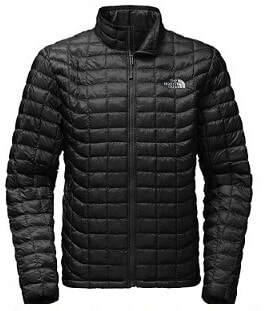 ​You will find below some of the most popular Columbia and North Face winter jackets and coats for men bought by Amazon customers. At the time of writing this article, each of these selected jackets and coats had received an average rating of at least 4.5 stars (out of 5 stars) from Amazon customers who have provided mostly excellent reviews. Therefore, we feel that you will probably be quite happy with any of these selections. 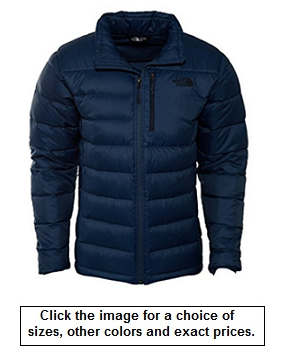 If you don't find a coat that you like among those presented below, you can click further down special links that will provide you with ALL the Columbia and North Face jackets and coats for men available on Amazon. ​When you click any of the Amazon link images below you will be provided with the exact price of the product and with a choice of colors. You will also have to specify your size. Note that Amazon prices often include a generous discount to the list price. If a discount exists, both the Amazon price and the list price will be displayed when you click the Amazon product link images below. Shell: 100% nylon with 100% polyester Omni-Heat™ Reflective lining. Insulation: 860 TurboDown™ insulation made of 800 fill goose down and 60g Omni-Heat™ synthetic insulation. Binding at collar and cuff. 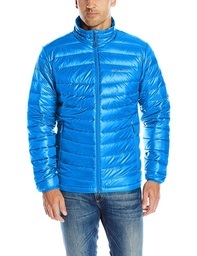 Shell: 100% ripstop nylon with 100% polyester Omni-Heat™ Reflective lining. Insulation: 550 fill down with 100g Omni-Heat™ synthetic insulation. 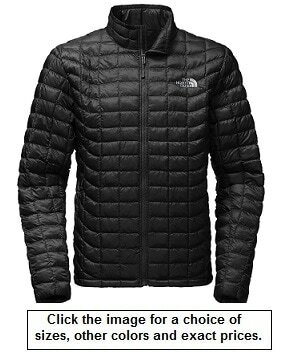 Updated with streamlined baffles contoured to fit your body, this jacket features ThermoBall powered by PrimaLoft, the new synthetic alternative to down that achieves ultralight, highly compressible synthetic insulation to keep you warm in a variety of winter conditions. The new insulation technology features round ThermoBall clusters that trap and retain heat to achieve exceptional warmth in cold, wet weather. Shell: 100% nylon ripstop with durable water-repellent DWR (Durable Water Repellent) finish. Insulation: Ultralight, highly compressible PrimaLoft® ThermoBall™ synthetic insulation. Length from center-back: 29.5 inches. Versatile, midweight jacket with tall, active fit. Front zipper and covered zip hand pockets. Internal elastic-bound cuffs and hem cinch-cord. Shell: 53% recycled polyester and 47% polyester with DWR (Durable Water Repellent) finish. 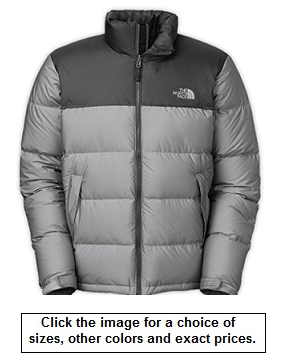 Insulation: 550 fill goose down plus 150 g Heatseeker™ synthetic insulation in side and shoulder panels. Secure-zip chest pocket and hand pockets. Shell: 100% nylon plain weave with DWR (Durable Water Repellent) finish. Insulation: 700 fill goose down. 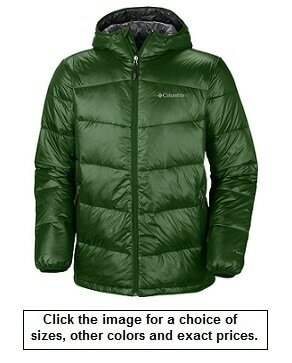 Classic, down insulated jacket with high-loft baffles now sports an updated fit. Velcro® adjustable cuff tabs and hem cinch-cord. Are you also looking for a high-quality and high-class men's fragrance? Creed is a French multi-national perfume house, based in Paris. Men's fragrances made by Creed are composed of the most sought-after olfactory ingredients and almost exclusively of natural components of excellence. The following article compares three of the best and most popular CREED men's fragrances: Compare Best CREED Men's Fragrances: Silver Mountain Water, Green Irish Tweed or Aventus?